Wonder if they bailed him out? Buying something like a Dodge Challenger SRT Hellcat is an experience. Undoubtedly, at some point, you’re going to want to show off everything it’s capable of to your friends, family and significant other. 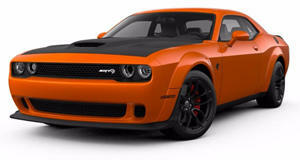 But for one new Challenger Hellcat owner, doing exactly that has landed him in jail. According to Fox 32 News, Chicago resident Christopher Garza was pulled over on an Indiana highway last Friday morning at around 1:30 am after being clocked at 158 mph by a state trooper. Then he got popped again at a second speed check when doing 151 mph. At that point, Garza began to rapidly decrease his speed after realizing he flew by a police car. Two dumb things Garza did: One, he demonstrated the car’s speed on the Indiana Toll Road, a stretch of tarmac constantly patrolled by law enforcement. Two, he was literally the only car on the highway at that time, making him an easier target for a bored trooper in the middle of the night. Garza told the trooper he had recently bought the car and "wanted to show his friends what his 707 horsepower engine could do," according to police. Aside from going fast and sounding awesome, 707 hp can also land you in the slammer. Hat tip to drly.